For 888 pits you need 4.40 – 8.80 MT of farmyard manure @ 5-10 kgs per pit .This 3-6 MT of farmyard manure is mixed with each 5 kgs of azospirrillum and phosphobacteria and pseudomonas and 10-25 kgs of VAM culture and sprinkled with water and covered in a wet gunny bags for a week or 10 days time . Seed treatment – Soak moringa seeds in 5% panchagavya solution ( 30 ml panchagavya in 1 lit water … take 1 lit water and pour 50 ml panchagavya into the water and mix it well and then put moringa seeds inside the panchagavya water solution for 1-2 hours in the evening and by around 7 PM take out all the moringa seeds from the solution and place it over the wet cotton cloth , tie the cotton cloth loosely and hang it overnight . Next day morning open the cloth bag and add 50 grams each azospirrillum and phosphobacteria to the seeds and mix it throughly and keep it under shade for 30 min to one hour before sowing int he pit . 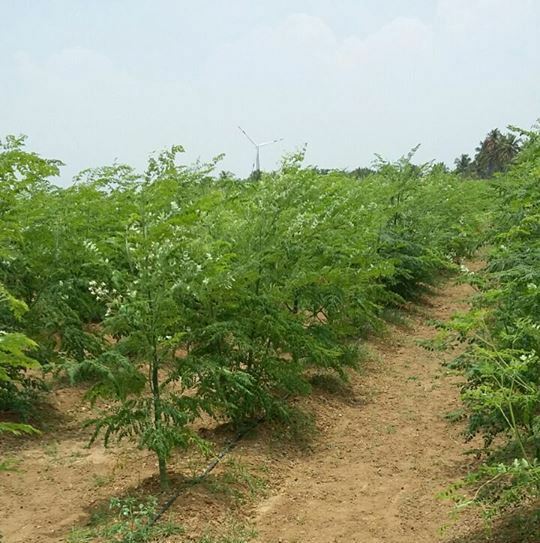 In about 50-60 days the moringa will have grown 60-80 cms heigh . Pinch the terminal shoot to the height of 60-75 cms from ground level . This will produce side branches . when this side branches grows 60 cms long , cut each side branch to half length say 30 cms ( 60 cms long side branches are cut back to 30 cms long ) . Again many branches are growing from these side branches . Again these side branches from earlier side branches are cut back to half of its length . Like this you need to do pruning ( cutting o branches to half of its length ) 3-4 times before flowering . Flowering and pod formation – in about 4.5 to 5.5 months after sowing the plant will start showing flowers . 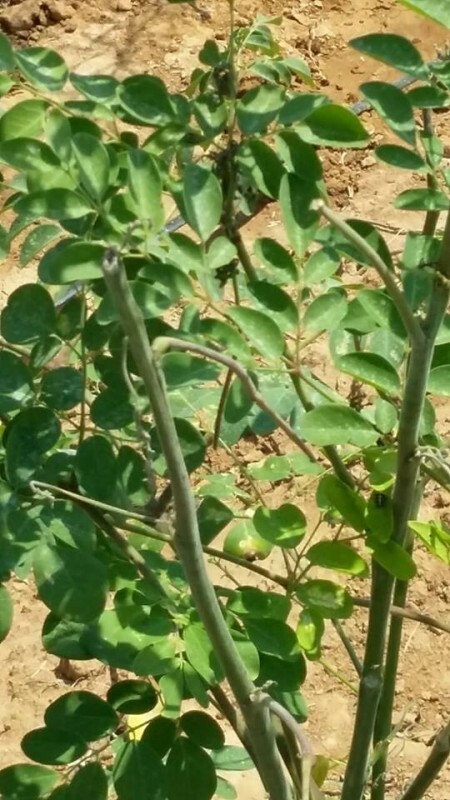 And in about 8-9 months after sowing the moringa fruits/ pods will be ready for harvest and harvest will continue for 3 months . For present condition – just cut the central shoots that is gown high into the sky and spray buttermilk coconut water solution two times at weekly interval and GA 3 once after cutting the central shoots . I am from Telangana and i am planning for Pkm 1 in the coming rainy season. Temp is summer reaches upto 45… Through out the year temp hovers around 30 except Nov Dec Jan. Rainfall is very less. Soil is red. Will this be suitable for Pkm 1? Please advise where to get quality seed like you mentioned. Pls share some contact nos. Thanks for very quick response. I have one more doubt. I was going through net and the forum and found that there is one more variety moringa is available ; ODC. From your personal knowledge and experience, Can u please advise which one is good between these two, PKM1 OR ODC. Is there any differences in practices in cultivation between these two varieties or practices are same. what you said is true, in ideal conditions (wrath of the nature and market is not in our hands), with the high yield, we can get the amount you mentioned. One farmer in our area earned a net profit of 3 lakhs per acre last year. Anyway thanks for your valuable guidance. 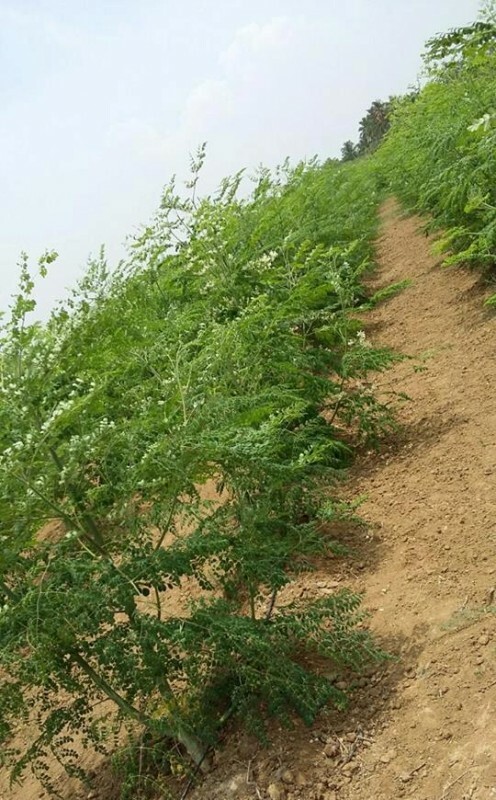 can you please share the details on the PEST and DISEASE management in PKM1 also any preventive measures like some people say that spraying of Neem oil every 15 days till the flowering stage will help in prevention of many pests in Moringa and papaya etc. Other pest are bud worm , hairy caterpillar , leaf webber and bark borer. Thanks a lot for your valuable advise. what are the crops that can be intercultivated along with Moringa. 2. at what time it is ideal? 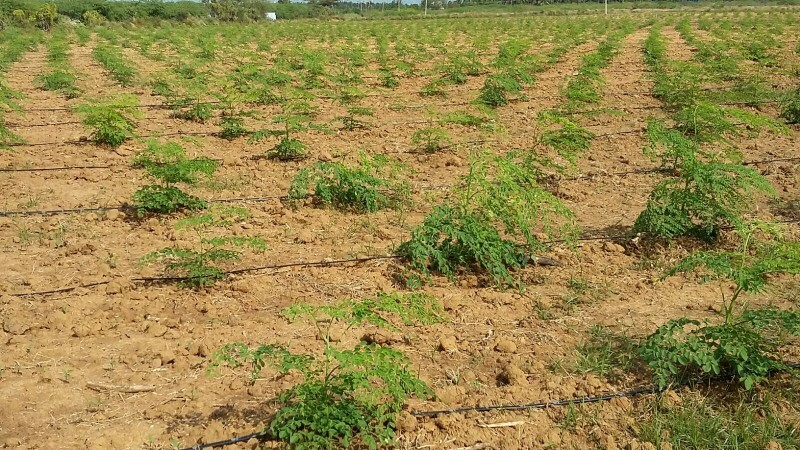 like both the Plantations should be started at the same time or after Moringa attains certain age? once the 1st harvest is done, I think we have to prune it back to 1feet from the ground? and also people say about inducing stress during this time… like water should not be given for a month or so? please let us know the answers. What is the trick to get flowers/fruits in off season time? What are the steps to plan the fruits to mature when the prices will be on higher side? But I am still not clear about high density planting (2 plants a hill with spacing of 1m x 1.5m). Do you recommend this high density planting or should I go with normal density? Also, you have mentioned that there will be 40% flower drop in Sep season but I have heard instances of close to 100% flower drop due to inclement weather. Can you please throw some more light on this? My land is located near Cheyyar (12 kms) towards Peranamallur with annual rainfall around 800mm. Soil type is red-loamy. Dry weather most of the time. I will follow the practices correctly and will also update the statuses, possibly with photos, from June onwards. Do the practices well but no need to post picture for me . Sorry I have not gone through all your lines, now only I read the entire paragraph. Ok seems good, very good analysis and you are technically very right. 100 percent you are correct. I have noted all your points and registered in my farm database. Thank you once again for your technical support. You are technically correct but commercially very wrong. I never said or say that your intention is wrong but your commercial line may mislead the farmers who are already in trouble because of no rain and very less market price of their output. We are reading in the newspapers that farmers are committing suicide around the country and you people are suddenly wake up and in a public forum that a farmer can year 5 lacks in one acre by cultivating drumstick without the basis knowledge of marketing, this is called misleading. This will encourage farmers to lake more loans and force them to leave out of agriculture sector. Kindly provide me the contact details of the farmers who have earned 5 lacks in one acre in tamilnadu. If anyone says or even if you give then he or she must be the “Germination seed seller” or “sapling seller”. This is what happening in goat farming, many commercial goat farmers advertise that “earn 50 lacks in one year” , to sell their breeds with high margin. I am from kanyakumari but my farm is not at kanyakumari district, which is located in Radhapuram Taluk of Tirunelveli Districit. This is also a rain shadow region like Aravakuruchi belt of Karur district or Dhamapuri dist of Tamilnadu. This is the main reason we have entered in to drumstick cultivation. Our area is rain shadow area however, Drumstick is being cultivated on more than 1000 acres of land both as a garden crop and field crop. Here we are the only farmer tested PKM1, PKM2 and ODC. Even we have started with 3 areas no we reach 25 acres. All other farmers of our region are cultivating PKM1, Alaki and Yalpanam, etc variety. In drumstick cultivation, yield is not a matter or issue, even a person without farming knowledge can get good yield if he follows proper schedule of water, fertilizer and pest control. Even we got abundant yield. How much yield you get in November, December and January is the matter. Getting yield in March April doesn’t help you economically. As per your calculation even if a farmer from Tamil Nadu gets 20 MT of yield, normally 70 percent of the yield comes in the month of March, April and August when the market price is very less ie. Rs 1- Rs6. He can manage to get only 5-10 percent of yield in November, December and January. The following is the last 12 months market analysis, this is our own database based on Nagercoil ,kavalkinaru, Tirunelveli, Channai, Bangalore and Ernakular markets. We are sending our pods to these markets only. April - 4 Rs, May - 12 Rs , June - 25 Rs , July - 60 Rs, August - 16 Rs , September - 8 Rs, October - 20 Rs , November - 60 Rs , December - 80 Rs , Jan - 90 Rs , Feb - 15 Rs , Mar - 4 Rs. As far my knowledge is concerned, cultivating drumstick in larger area may end with huge loose for Tamil Nadu, Kerala and southern part of Karnataka and Ander Pradesh farmers . ie. The states, which are receiving north east monsoon. But I will recommend drumstick cultivation for small scale farmers , for example, even if the market price is 4 rs per kg that also profitable for small farmers who do in one or two acres, sine their family members only do the harvesting , farm activities and transportation to the nearest mandi. But in case of big farmers even 10 rs per kg also lose for them. We are also thinking to switch over to leaves cultivation where there is no region or climate issue. Going in larger area of drumstick cultivation in Gujarat, Maharashtra and Telungana is like a golden goose for the next four to five years. Now many big farmers in Gujarat and Nashik and Nagpur region of Maharashtra have entered this cultivation in large scale like 50 acres, 80 acres and earning 3 to 5 lacks per acre. This is my own experience I visited more than 25 drumstick farms in Gujarat and Maharashtra where more than 400 acres are cultivated under our guidelines. We are providing Agri- consultant service on drumstick cultivation to the farmers of Gujarat and Maharashtra for free of cost. Kindly contact in the below address.